A great meal is more than the sum of its parts. Yes, you want great food, great service and great ambiance. Yet, to have a really satisfying meal all these things have to come together in way that can’t totally be explained in words. It’s just kismet. Le Petit Restaurant in Sherman Oaks manages to accomplish this little feat of magic. The food is simple and well prepared, if not Michelin quality, the ambiance, very Left Bank and the service brusque yet attentive. All and all each piece by itself would perhaps, above average, nothing more. But put them all together and each dining experience I’ve had at the restaurant just has a certain, je ne sais quoi. 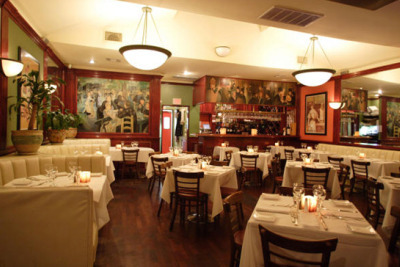 The menu is straightforward French fare mixed with an interesting smattering of Mediterranean dishes and influences. The wine list is small, featuring French and Domestic wines by the glass and bottle. Every time I go I start with the Baked Brie on Croute ($6.95). It’s a generous portion of brie encased in a flaky shell. It’s served with a tangy champagne sauce that cuts through the richness of the cheese. This could seriously be a meal in and of itself. I also love into the Black Mussels Poulette ($9.50). The mussels are tender and not at all chewy. The white wine and shallot sauce rich and creamy – the kind you want to sop up every last bit of. I have an ongoing love affair with the Baked Lamb Shank ($17.95). Or maybe it’s really a love hate relationship. The first time it was so good I ate every bite, the meat fell off the bone and the sauce was velvety. They serve it with couscous and carrots – a bit of that Mediterranean influence I mentioned earlier. Sadly, the second time I ordered it, I sent it back. The lamb was bland and the sauce tasted like canned beef broth. The third time was a charm, so I’ll just chalk the unpleasant experience up to a bad night. Equally simple yet tasty is their Grilled Entrecote or Rib Eye Steak ($23.95) I’ve only tried it once and it was cooked a perfect medium rare and the crispy Pomme Frites to die for. I added the mushrooms, which I sort of regretted because they were a bit too salty. They also offer the French classic, Coq Au Vin but let me warn you, as our waiter did, that you might not recognize their version, which I was told is very traditional. Whatever version it was, the dish was delicious. It had a stew-like consistency with the chicken falling off the bone and the petite pearl onions had the perfect firmness. On Monday and Tuesday nights, they offer a special Lobster Night (1 1/2 pounds) served with a choice of soup or salad for $24.95. I usually wrap up the meal with a little espresso or café macchiato. The service is never rushed – very European. Walking out onto Ventura Boulevard after the meal, it’s always a bit of a culture shock because for just a moment you could relax and fool yourself into thinking your actually are in Paris, just for a moment. Maybe that’s the magic of this place. 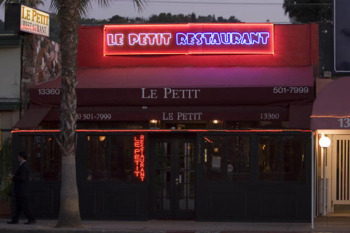 Le Petit Restaurant is located at 13360 Ventura Blvd., Sherman Oaks. Open for dinner only Sun-Thurs, 5-11pm; Fri-Sat, 5-11:30pm. Call (818) 501-7999 .